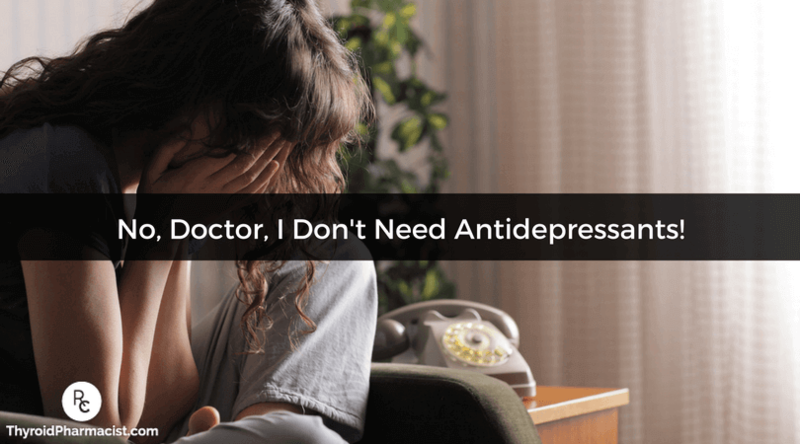 No, Doctor, I Don’t Need Antidepressants! One night, I had a lucid dream that brought me to the past. For those of you that have never had a lucid dream, in this type of dream, you know that you are dreaming and, thus you know that you will be safe no matter what happens and what you do. These dreams can be very liberating! In this dream, I was taken back to a doctor’s visit back in 2006, when I first graduated from pharmacy school, and when I first began to have overt thyroid symptoms. In real life, I went in because I didn’t feel like myself, but my physical symptoms were ignored during the appointment. Instead of focusing on my neck pain, sore throat, palpitations, and fatigue, the doctor started narrowing in on my anxiety and obsessive compulsive tendencies. I was nervous and fidgeting and somehow we got on the topic of my habits. I remember explaining that I triple checked prescriptions before I filled them (this was, after all my job and requirement as a dispensing pharmacist), but somehow, describing my daily job duties made me appear crazy to him. He kept digging further, trying to paint as though everything physical I reported was in my head. I remember he asked me if I frequently washed my hands. I said, “No, but I would if I was preparing intravenous (IV) drugs,” (which is also a requirement for pharmacists that make IVs). I was anxious and I almost felt like he was quizzing me like he would report me if I didn’t wash my hands enough—I was a new grad and was used to being quizzed by older authority figures… and so of course, I looked even more crazy to him. In my younger days when I was a rebel without a cause, I would have told him to shove it and that as a trained pharmacist with a doctorate degree, I knew better and that I came in to address my neck pain, fatigue, and sore throat 🙂 But instead, I was polite and sheepishly took home a prescription for antidepressants that I never filled. You see, somewhere in my mid-twenties, I began to censor myself. My teens and early twenties were all about seeking pleasure, being myself and speaking my mind… but then it changed. I don’t know if it was my professional training, my friends, peers or partners, or simply growing older, but as time went on, I became pathologically polite. And so, even though my needs weren’t met and even though I knew that my symptoms weren’t just in my head, I kept quiet. Three years later I was found to have thyroid antibodies that were in the 2000+ range and a thyroid gland so damaged that I needed to start thyroid medications. Research has shown that anxiety, depression and a general feeling of being “unwell” are early signs of an autoimmune attack on the thyroid and can be correlated to thyroid antibodies, even when the TSH number is still normal. The most common type of anxiety disorder reported in people with thyroid antibodies is obsessive compulsive disorder (OCD). OCD is also more common in pharmacists and Type A’s, so I am intimately familiar with it 🙂 I can tell you from years of tracking that my OCD tendencies flared up with rising thyroid antibodies and reduced as my antibodies dropped. Remission helped me become calm and cool, while Hashimoto’s flares brought on OCD. Thus I now consider OCD an indication of an impending flare. In retrospect, it only took me three years of feeling anxious to get a proper Hashimoto’s diagnosis, and only took me another three years or so to get into remission and to become calm once more. Some people are not that lucky. They struggle for years without proper diagnosis. It breaks my heart to think about the many thyroid patients who get labeled as “crazy” or “hypochondriacs” instead of being tested for thyroid antibodies. Do antidepressants help these conditions? I think it’s debatable. While I don’t discount that many people have been helped by antidepressants, giving a person mood stabilizing medications because of fluctuations in mood due to Hashimoto’s is like putting masking tape over the check engine light in a car instead of, you know, checking the engine! Furthermore, antidepressants alone should never be the sole solution, even for a person with depression and anxiety! There are many other strategies that can help a person with depression, whether used in conjunction with antidepressants or on their own: bright light therapy, T3 containing medications, meditation, counseling, nutrition, Omega-3’s… I could go on! For OCD, there are supplements like 5-HTP and Myo-Inositol that can really help! As a side bonus, Myo-Inositol can reduce TPO antibodies, balance blood sugar and reduce TSH! While I believe most medications have their time and place, the truth is, antidepressants are dirty drugs (this is official pharmacist lingo). They interact with many receptors leading to a smorgasbord of symptoms. In my past life, when I was working in consulting with mental health clients, I often got reports of people feeling like zombies, gaining weight, feeling dulled, living in a fog, having sexual dysfunction, becoming manic, and feeling worse on antidepressants. One of the scariest side effects of antidepressants that I learned about in pharmacy school is increased suicidality. So people who were started on medications for depression would be more likely to die by suicide within weeks of starting them. The theory that was proposed to us students was that “people got more energy before their mood improved and thus, this burst of energy gave them the opportunity to take their lives.” This was so scary to me as a young practicing pharmacist. I remember one of my regular patients at a pharmacy who became very depressed and had just started on an antidepressant. I made her promise to call me to check in every few days to make sure she was OK, and I would call her at home whenever she didn’t visit the pharmacy for a few days… Suicide is a permanent solution for a temporary problem and is devastating for loved ones of the deceased, who often go on to have post-traumatic stress disorder, survivor’s guilt, and even new onset autoimmune disease. One day I’ll write more about my personal connection to loss… but for now, if you’re reading this and struggling with depression, I want you to know that you can feel better—and you will feel better—and there are so many people and things that can help you. Don’t give up. Antidepressants can also cause a downregulation of our internal production of neurotransmitters. What does this mean? This means people can become dependent on taking them. 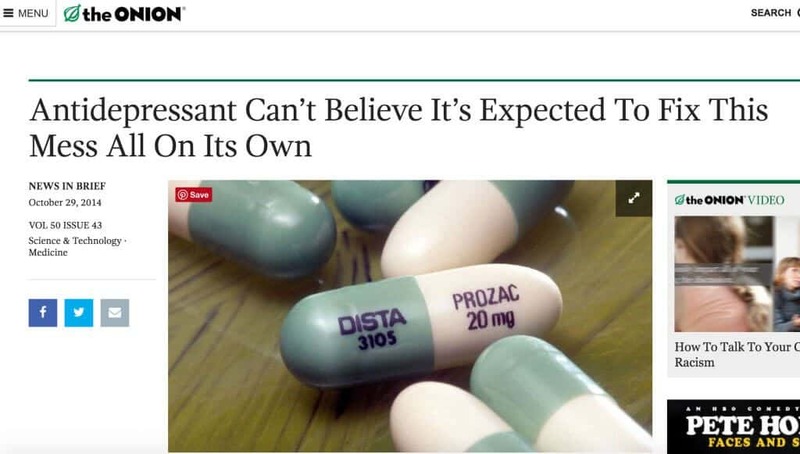 I have seen it first hand and have had to work with numerous people to wean them off antidepressants slowly in my past life as a consulting pharmacist. This is because antidepressants prevent us from properly clearing serotonin from our brains so that it sticks around longer. Unfortunately, the body takes notice of all of this serotonin hanging around, and soon we began to produce less serotonin and we become less sensitive to the serotonin we do have—sometimes this may even be permanent (if not addressed). It’s funny, as a young pharmacologist I was exposed to the concept of permanent alterations in the body that pharmaceuticals could produce, yet most pharmaceuticals are not studied for longer than a few months at a time. Furthermore, antidepressants are not always effective. I have seen this numerous times over in patients as a pharmacist, and less than 5% of people were found to be in remission from depression with SSRI drugs, even after using them for a year in a large-scale study known as the STAR*D trial! This is why I’m such a raving fan of the work of psychiatrist Dr. Kelly Brogan, a woman with a powerful voice, who is trailblazing root cause treatments for depression and anxiety. And guess what? She NEVER uses antidepressants! Dr. Brogan uses treatments like nutrition and lifestyle changes to help people awaken and turn on their inner healing capabilities to help them recover from depression and anxiety. Dr. Brogan has also reversed her Hashimoto’s, so she really gets it and I truly consider her to be one of my Hashi sisters. I really think the most amazing women are affected with Hashimoto’s so that they can be given the opportunity to heal and help others do the same—and if you’re reading this, I think you are likely to be one of them! Sign-up to watch the replay anytime! So going back to my lucid dream. I did things differently this time during that doctor’s appointment. I stopped him mid-sentence and said, “No, Doctor, I don’t need antidepressants. I came in because of my physical symptoms.” I may have thrown a swear word or two in there somewhere. And it was liberating—and you know what? Now that I’m a rebel with a cause—a Root Cause Rebel—my voice is getting stronger and my pathological politeness is getting weaker with each and every day. I enjoy reading your emails and I have read your Hashimotos Guide book. You have really helped me during my Hashimotos journey. After your email about depression I was wondering if Holy Basil was safe to take? I just recently started taking the New Chapter Holy Basil. I read some reviews on Amazon that if you have low blood sugar or low blood pressure it should be avoided. I’ve had low blood pressure for about 5 years but my doctor says low blood pressure is good. I’ve always worked out regularly my entire life and never had low blood pressure. So I think I developed low blood pressure due to my adrenal fatigue and difficulty sleeping. I started to take Holy Basil for adrenal fatigue and difficulty sleeping. Seems to be helping a little but I’ve only been taking it 3 weeks. I was curious what you think about Holy Basil and if it safe to take with Hashimotos? I’ve tried Ashwaganda and Rhodiola but they make me feel worse. Mary- Holy Basil is an adaptogenic Herb, adaptogenic herbs can be any natural herb products that supplement the body’s ability to deal with stressors. In the 1940s Dr. Nikolai Lazarev defined adaptogen as “an agent that raises the body’s ability to resist stress by countering undesired stressors, whether physical, chemical, emotional, or biological.” Not everyone will need every single supplement! In fact, I believe that most nutrients should come from the diet, this is why I always list food sources for most of the nutrients, vitamins, minerals and probiotics that are depleted in Hashimoto’s in the book and on the blog. However, some may require/prefer supplements and the supplements on the website are a resource for those that do. I recommend getting tested for deficiencies to determine your need for a supplement as instructed in the book and blog. I also don’t recommend starting multiple supplements all at once. I recommend starting one at a time and then adding another a week or so later once it has been confirmed that the first supplement is not causing any harm. Hi Kelly thank you for all you do! Can you direct me to research about the antidepressant dependence? (Re: “Antidepressants can also cause a downregulation of our internal production of neurotransmitters. What does this mean? This means people can become dependent on taking them..”) this is why I am asking: When asked by a new doctor why I take Paxil I say, “because I cannot get off of it.” They then want me to state why I was prescribed it in the first place. Of course the original doctor’s reason was “depression”. I later became leery of this diagnosis and have tried to wean off of it various times. It’s not depression that comes back – it’s full blown withdrawal. And even when I get past the horrible electric-shock waves to my brain, the nausea, the vertigo. Then I have to contend with terrible sensory issues that send me to a dark quiet room and the general feeling my brain is fried. I’m Irritable and volatile and all over the place. I was NEVER Like this before. This is not my depression “resurfacing”. When attempting to explain this phenomena I have been met with the patient, condescending looks of doctors one too many times and I’d like some research to back me up. Thank you so much! Joanna- I would highly encourage you to Join Dr. Brogan and me as we discuss her unique approach to depression and anxiety without psychiatric drugs, followed by 30 minutes of Q&A. Here is the link below! I highly recommend that you work with a functional medicine clinician. It’s a whole medical specialty dedicated to finding and treating underlying causes and prevention of serious chronic disease rather than disease symptoms. Hi! I have been dianosed with hypothyroidism for well over a decade.. Who knows hown long I’ve had it for. Somewhere along that time, the word hashimotos was utteted. About a year ago, I opened the discussion about depression with my endocrinologist. She dismissed my claims and in more words, said it was my outlook on life. About seven weeks ago, I went to my primary and opened up the concersation about depression and anxiety again. How quickly she prescibed an antidepressant. I figured, well they should know, so I’ve been taking this with maybe some relief in anxiety, but none in the depression sence. Should I ditch my endocrinologist or primary? Any help? Ashley- Did you know that if you live in the United States, the UK, Australia, Europe and most developed countries that add iodine to the salt supply and take thyroid medications, there’s a higher probability that you do have Hashimoto’s? Depending on the source, estimates are that between 90-95% of those with hypothyroidism have Hashimoto’s. But most doctors will never tell people that they have Hashimoto’s, or that their own immune system is attacking their thyroid. People are told that their “thyroid is sluggish”, and that these things happen with age and “Just take this pill, you’ll be fine.” I hope you check out these articles that I wrote. Here are the tests you need for diagnosis. Most endocrinologists don’t run them all so you will have to request them. Make sure to request a copy of your labs as well. I signed up for the webinar with Kelly Brogan but could not get the link to work. Is it possible to access a transcript of the session? Kristobol- Try refreshing the page or opening the link in another browser. Unfortunately that didn’t work either. I had emailed in a question re the link between high antibodies and severe depression – is it difficult to get depression under control if your antibodies remain extremely high? Premi- Thank you so much for your support! I strongly encourage you to keep looking until you find a skilled practitioner who can help you with Hashimoto’s, they are out there. Here is an article I wrote about my challenges finding Dr. Right. I have sle. Thyroid interactive. Raynauds. Along with a slew of gastro issues. Im so bugged out from everyhing. I take also the patch. Im very. Depressed. And don’t know where to turn. Joyce- Did you know that reactive foods trigger an inflammatory response in the GI tract, leading to malabsorption of nutrients (gluten sensitivity in particular has been implicated in causing a Selenium deficiency, a well known risk factor for Hashimoto’s), and can also produce intestinal permeability whenever they are eaten? Most people will see a dramatic reduction in gut symptoms, brain symptoms, skin breakouts and pain by eliminating the foods they are sensitive to. Some will also see a significant reduction in thyroid antibodies! An additional subset of people, will actually be able to get their Hashimoto’s into complete remission just by getting off the foods they react to, normalizing their thyroid antibodies, and some even normalizing their thyroid function! Here are a couple of articles you may find helpful. I found your post about antidepressants while searching for any information about goiter and thyroid yet again. About a year ago my nurse practitioner tried to convince me that I need to “at least try” antidepressants. I am a people pleaser and felt like she thought I was a hypochondriac or just depressed. My husband had gone to this appointment with me and I finally had the guts to say no to antidepressants. She continued to press the issue and told me to discuss it with my husband some more while she left the room. I was in tears from the frustration that I had already said no. I started question myself. My husband brought me back to reality and was supportive of my decision. She came back in the room and continued her sales pitch even after I said no several more times. I finally said to go ahead and send it to the pharmacy if that made her feel better but that I would not pick it up. Which she did. I switched practitioners within the group so I didn’t have to see her anymore. I never did fill the prescription. Instead I read all I could I could about my symptoms and realized it was likely thyroid. Shortly afterwards my husband and daughter noticed that my neck was swollen. My doctors still didn’t listen. I recently went to the walk in clinic due to some bug going around. While there another nurse practitioner and I were talking. On a whim I decided to say something about my swollen neck and showed her thinking I would be ignored again. To my surprise she said it’s likely a goiter which was confirmed by an ultrasound. However, the diagnosis was to do nothing! My bloodwork came back within range. Shortly after a friend told me to go to a local nutrition shop. The fame had been in the business for 30 plus years. I walked in the door not knowing what I was looking for when asked. I pulled down the neck of my tee shirt and started to ask a question. The owner stopped me and said I have a goiter and to try iodine and magnesium taurate. I did and actually felt better for months until I got very busy and ran out. I picked up more and started taking them again. However, my neck swelled again and I have been very OCD. I had not linked the obsessive need to clean the house as another symptom. Thank you for bringing it to my attention. I have finally found an endocrinologist that I am willing to see and am cautiously optimistic. I am worried because I have witnessed my mother and several female friends struggle with medications like synthroid. They seem to get worse rather than better. I’ll keep reading all I can. What I have learned is that I have to speak up and be proactive about my care. I am not depressed nor am I a hypochondriac. I can’t rely on my doctors to know what is best for me. Audrey- Thank you so much for sharing! I strongly encourage you to keep looking until you find a skilled practitioner who can help you with Hashimoto’s, they are out there. Here is an article I wrote about my challenges finding Dr. Right. Sandy – thank you for following this page and for sharing. Forgot to mention I take 88mg. of synrhroid and levels are normal. But every year they gradually increase it to maintain those normal levels. At my latest endocrinologist appointment my doctor said that my TSH was in the normal range with help from Synthroid and other than doing a higher dose of that and increasing my risk for osteoporosis there wasn’t anything more she could do. Her suggestion? Check with my family doctor about a possible mental health issue. I have a B.A. in psychology and while there were plenty of times in my studies I would have diagnosed myself with pretty much anything in the DSM IV I knew that my physical symptoms were not in my heaď. Brain fog and fatigue are stealing my life and it is a shame doctors seem so unconcerned with treating the root cause of the problem. Becky – thank you for following this page and for sharing. Most conventional physicians use the TSH test to determine if one has a thyroid disorder and to dose thyroid medications. However, this test can often time be misleading, as levels of circulating hormones may fluctuate at different times, such as in Hashimoto’s, the person affected may fluctuate between highs and lows. Additionally, when scientists first set the “normal” ranges of TSH for healthy individuals, they inadvertently included elderly patients and others with compromised thyroid function in the calculations leading to an overly lax reference range. This resulted in people with underactive thyroid hormones being told that their thyroid tests were “normal,” based on this skewed reference range. be ‘Hyper’, since no one seems to want to address its existence anymore!! Mildred – thank you for reaching out. Graves and Hashimoto’s are both autoimmune conditions that affect the thyroid. They are thought to be closely related. Sometimes one turns into the other. The difference is the site of the antibody attack. In Hashimoto’s, the antibodies are found to thyroglobulin (in 80%) and thyroid peroxidase (TPO) enzyme (in 95% of people) Hashimoto’s results in hypothyroidism and is usually treated with Synthroid and replacement hormone. The same antibodies may be present in a smaller percentage of people who have Graves, but the main antibody is to the TSH Receptor (TSHR-Ab). Usually, people with Graves have hyperthyroidism, and they are treated conventionally with thyroid suppressing drugs (methimazole) or radioactive iodine to destroy the thyroid. At that point, the thyroid will no longer produce hormones on its own, and these people end up on Synthroid as well. Most thyroid conditions result from the immune system attacking the thyroid because the immune system is out of balance. Even when the thyroid is taken out surgically or treated with radioactive iodine the autoimmunity still persists in most cases. Many people will have their thyroids removed, and will develop new autoimmune disorders such as Lupus, Rheumatoid arthritis, etc. The immune system just finds a different target. I have started taking Zoloft 25mg per my primary care physician. I do have an appointment Jan 21 with an endocrinologist. Will taking Zoloft affect any testing the ending may do for thyroid, adrenal, etc? CR – thank you for reaching out. I recommend that you check with your practitioner or lab before testing. Elaine – thank you so much for sharing your journey with me. <3 I am so sorry you are struggling with all of this. I understand how overwhelming and frustrating it can be. There are quite a few options for thyroid medications. In my experience, what works for one person may not work for another. If your doctor will not prescribe the medication which you are looking for, ask your local pharmacist for doctors in your area who prescribe the medication you are looking to try. Have you read these articles? Hello, your information has come to me at the perfect time. I have had severe anxiety and panic attacks come on over the past 2 weeks, and my TSH level, at its lowest, was .393. My primary Dr stated I have subclinical hyperthyroidism and is referring me to an endocrinologist next week. How do I get by until I see the specialist? I am taking Ativan just to get me through the anxiety. 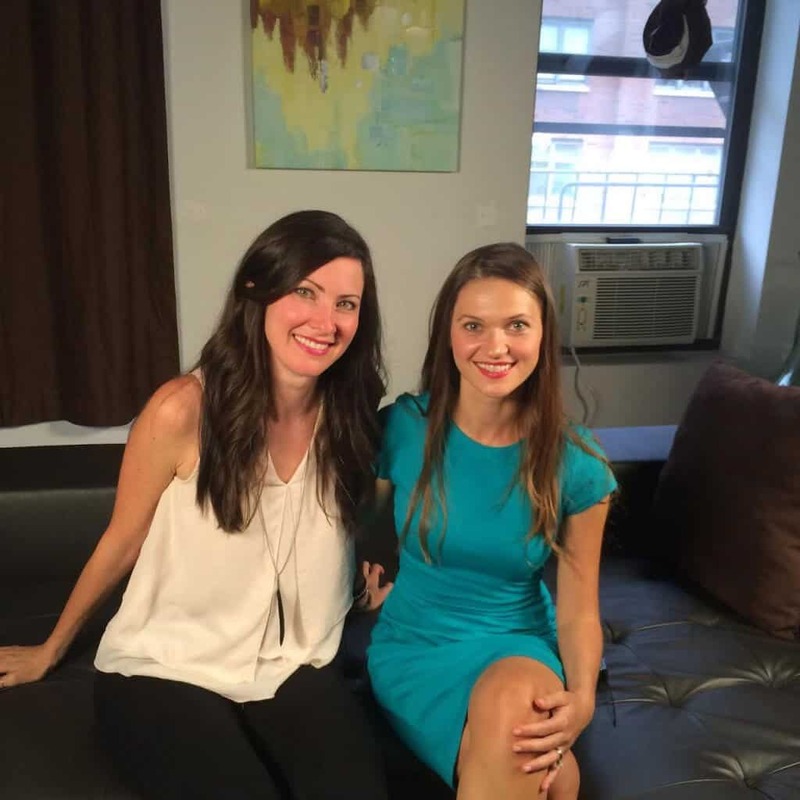 Stephanie – thank you for reaching out. I am so sorry to hear you are struggling with this. Anxiety symptoms are very common in people with thyroid disorders.